Ugh, guys I'm going to level with you here: the kid's math homework stresses me out. I honestly love math but every time I look at the kid's books when they ask me for homework help I swear I'm looking at an unsolvable rubix cube. Is it just me? I can't be the only one. 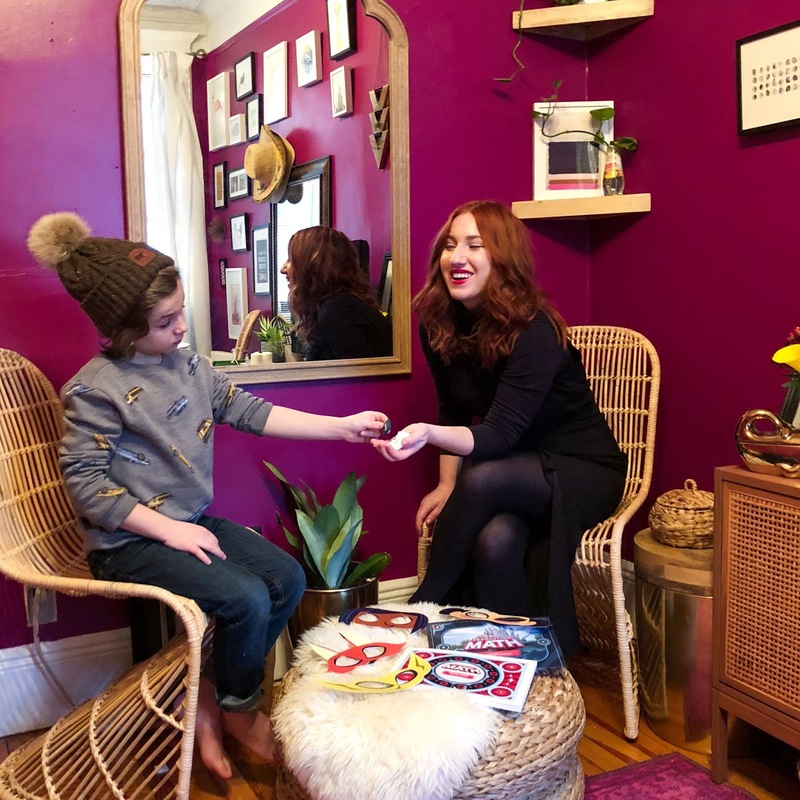 I'll be transparent here, we're not huge screen-time parents. You're not going to find them on tablets or phones at home. 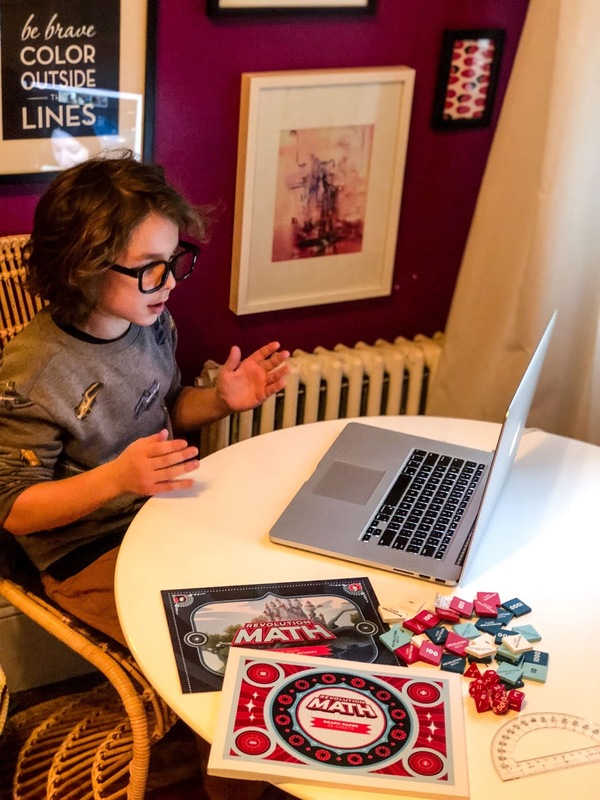 So, we're sometimes skeptical about online 'math games' they bring home because they have a browser open with ads and one wrong click can fill up a screen with ads and who knows what. Truth: It happened to David's computer last year and we ended up having to toss it. Now, with Revolution Math they're not clicking through a bunch of browsers. 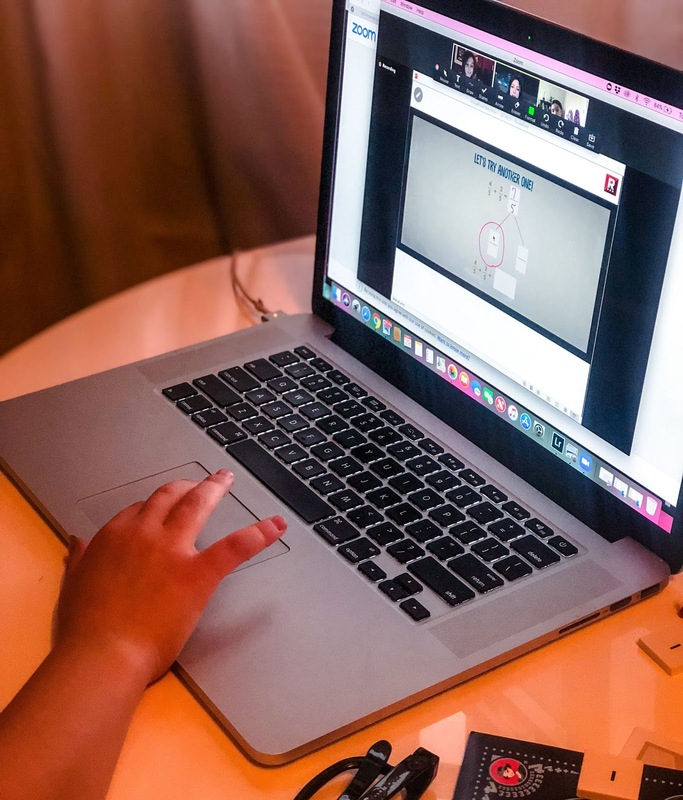 They are on Revolution Math's platform via Zoom. They're also overseen by a teacher so I feel 100% comfortable leaving them alone with my computer for an hour. It's extremely user friendly and follows common core-aligned curriculum that seems so much more like play that they don't realize they're learning. 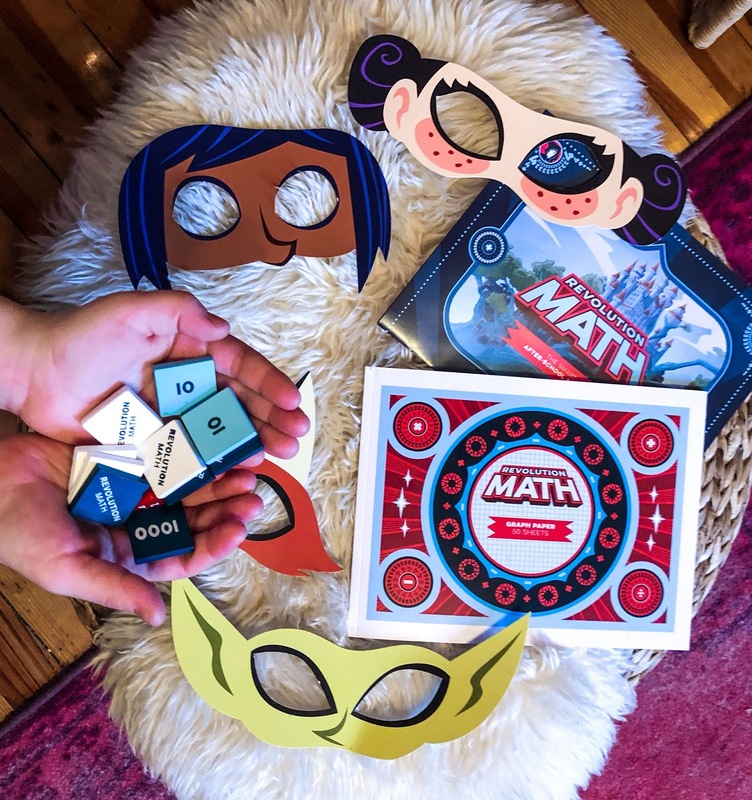 When you sign up you are sent a welcome box that includes character masks, game pieces, flash cards, dice, graph paper, and a protractor to make things a little more hands on during each session- which is a huge plus in my book. I watched Aiden from the couch for his first session and honestly, he was glowing. He was having fun with his teacher, Heather (who was amazing) and his classmates. They did fractions and incorporated them seamlessly into the storyline of the adventure. Each time they completed something they were awarded gems that can actually be used for real-life prizes like legos, a skateboard and/or a drone! So, if you need that little extra incentive to get them going, this is it. 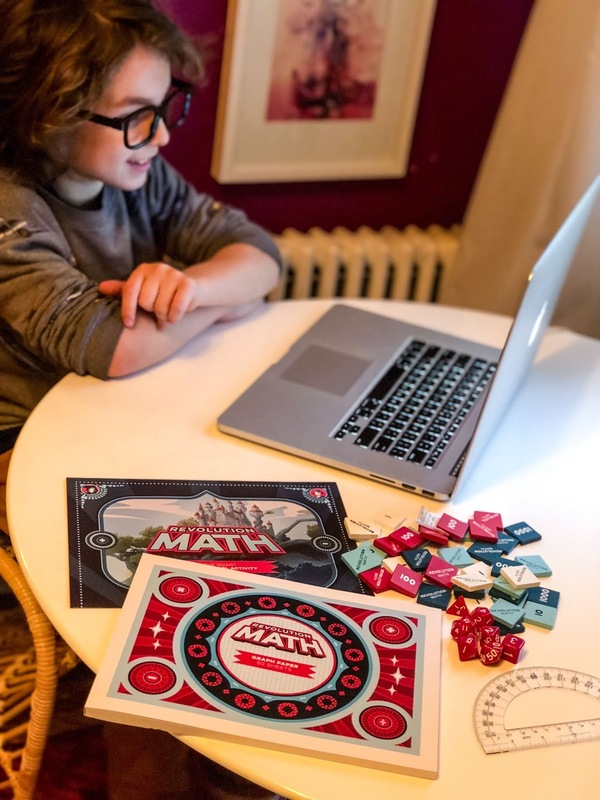 They might be in it for the prizes but they leave with a deeper understanding of important math concepts and have more confidence encountering the material. Win, win. And for parents interested in how their child is progressing, the teacher helps determine each individual's progress and areas of improvement which they relay each week to parents via email updates. As for pricing, it's a lot more affordable than their competitors that run up to $459 a month for much larger class sizes (20+). Revolution Math is $149 a month, or $99 a month (annually). But, They've been amazing enough to extend a $1 30-day trial price to my reader with promo code "MEGAN1". Of course, after the 30-days you can cancel if it's not the right fit or extend if you love it. Sponsored by Revolution Math. All opinions are my own.